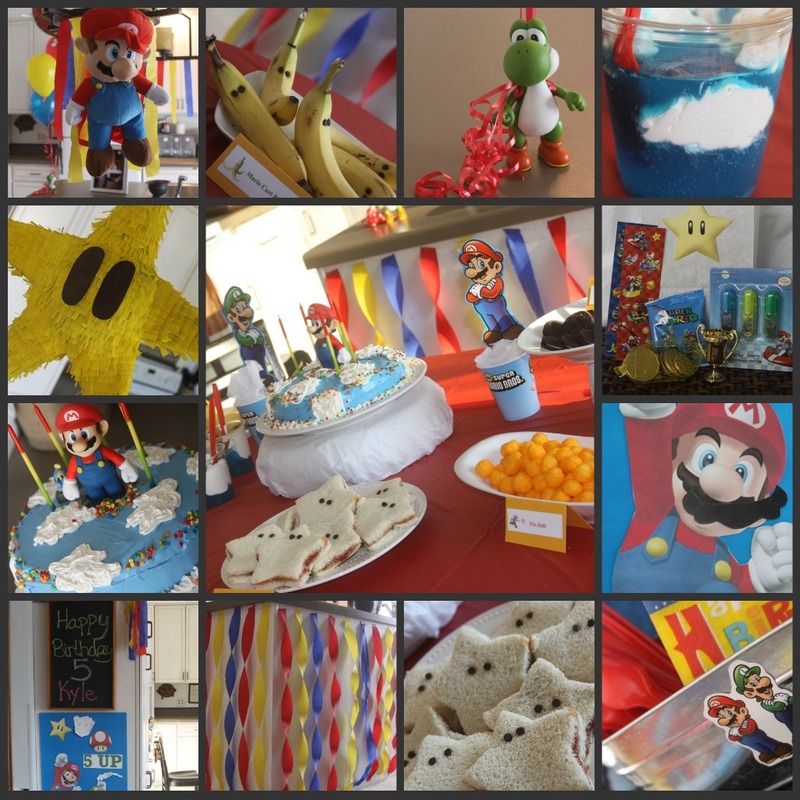 I had a blast putting together a special Mario Brothers themed birthday party for my five year little boy old and his friends! 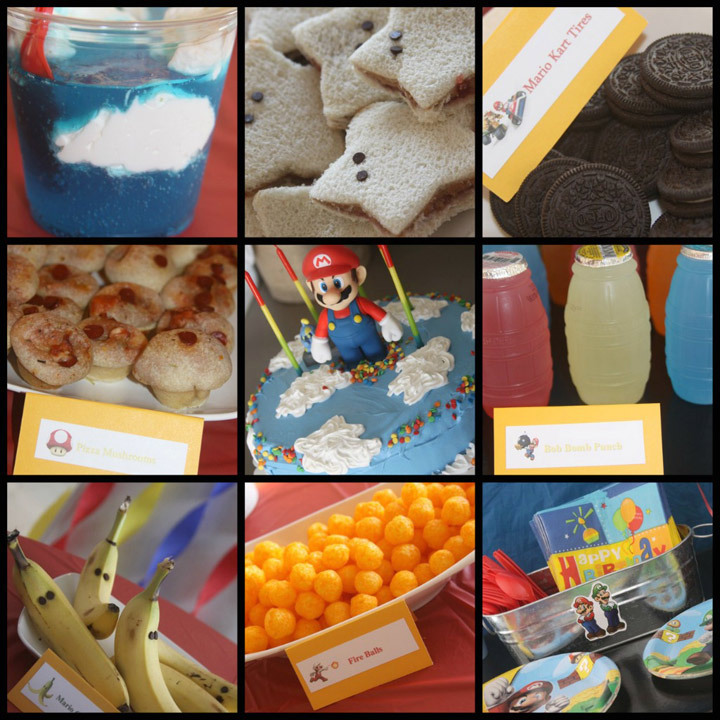 The party was complete with lots of fun activities for preschoolers and kid friendly food all with a Mario Brothers twist. When my first born decided he wanted to have a Mario Party and invite some of his friends from school I was so excited. It was a fun theme and something that he really loves right now. 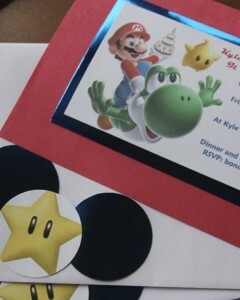 I made up some invitations that included Mario riding on Yoshi’s back and holding a birthday cake with a 5 on top of it. I used Picnik (which is sadly closing down – Boo) which had some great video game like fonts. I printed out my invitations on card stock paper and then glued them to some cool blue metallic paper that I found at Target. I added another backing in red or yellow. We hand delivered the invitations to his friends at school so we embellished the envelopes with the kid’s names and a Mario star. The Food was by far my favorite part of the party to prepare! Since all of the guest were 4 and 5 year old boys I wanted to make sure there was food that they would actually eat, and have fun eating too! 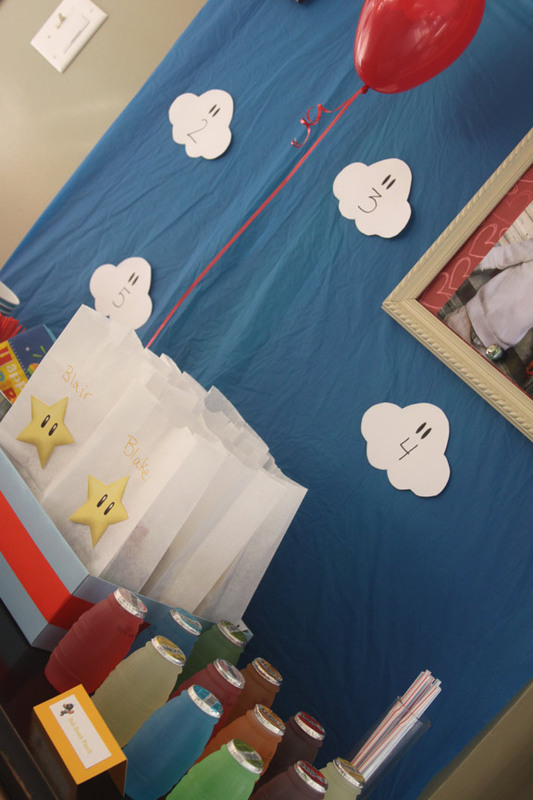 I came up with some really cute ideas that included foods that preschoolers love and were really fitting with the Mario theme. 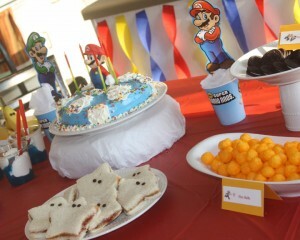 From left to right of the rows here is what I served for the Mario Brothers party! I set all of the food up on a table that was covered with a red table cloth. I then used graphics that I found online to create name cards for all of the food. I was able to prepare all of the foods ahead of time. The jello, sandwiches, and bananas were all ready to serve and plated from the refrigerator the morning of the party. I even had the pizza all put together in the fridge and ready to pop in the oven and baked right before his friends came. A simple Cookie cutter and mini chocolate chips for eyes transforms simple peanut butter and jelly sandwiches into Mario star sandwiches. 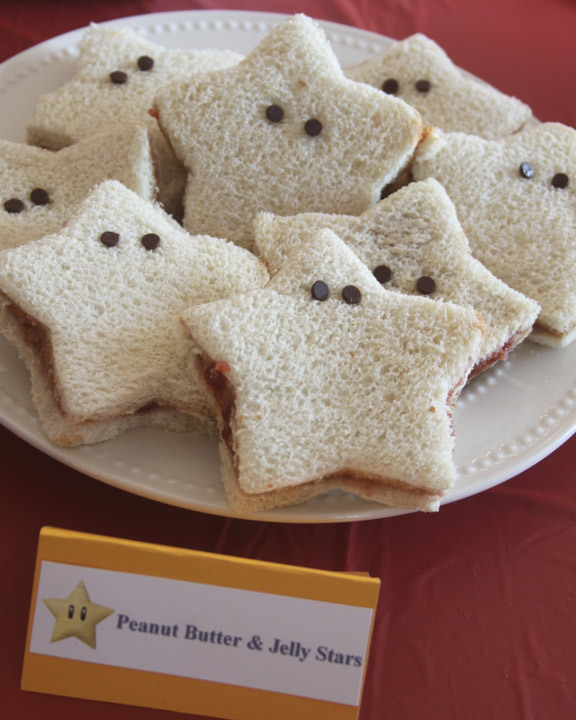 These were a big hit, and what kid doesn’t love a good PB& J. In the same fashion as the star sandwiches I pushed mini chocolate chips into the bananas to add eyes. 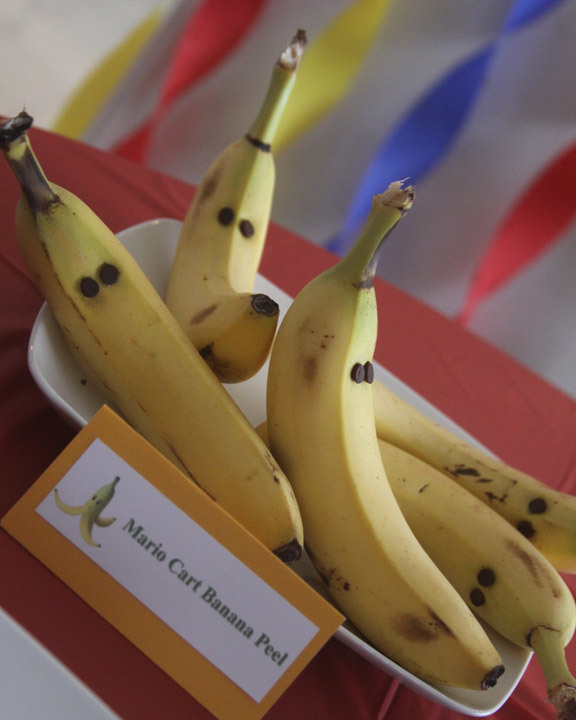 It created Mario Kart banana peels that were simply irresistible to the boys at the party. I realize that I spelled “kart” wrong on the card and was quickly informed by the hubby that I did so! 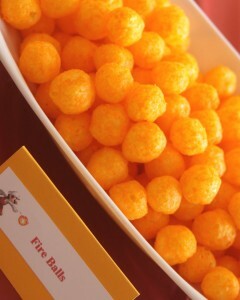 I got a big old tub of cheese balls and put them in a bowl labeled fire balls! These were so fun for the boys, and yes a few landed up launched like fireballs, but it was awesome to see the boys so excited about the food! My daughter and I had a blast making the Mario Land sky jello! 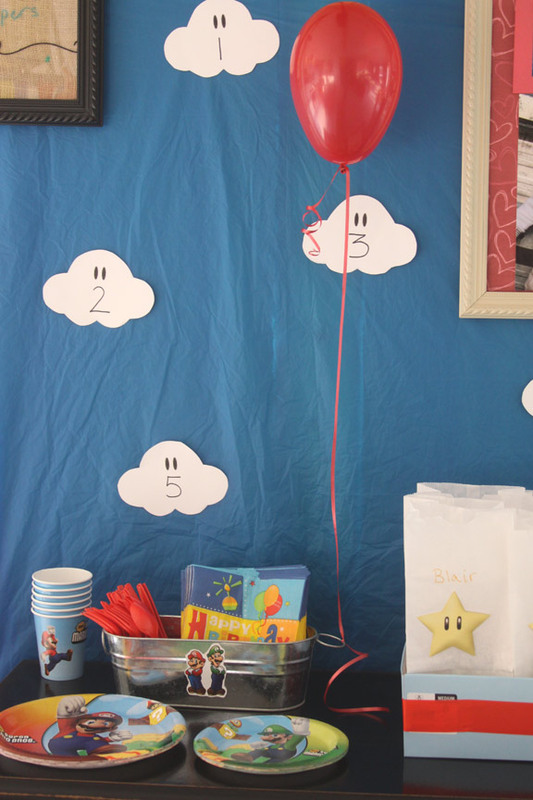 I spotted this cute idea on Pinterest and couldn’t wait to make these for the Mario party. The were the perfect fit! They are a combination of berry blue jello and homemade whipped cream. 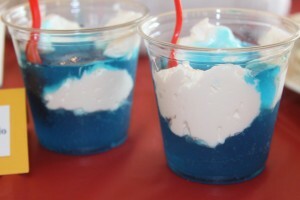 We prepared the two components and then placed layers of each in a cup to look like clouds in a sky. Served in a small clear party cup, this jello turned into the perfect Mario treat to serve the boys. I got a some brightly colored barrel juices at the grocery store to serve for the kids to drink. I put a bunch of straws in a narrow glass face near the juice, so all the kids had to do was pick a star and punch it throughout the cover on the drink. It really made serving drinks simple! No pouring, or opening drinks for everyone, and they thought it was really fun. I think the drinks were the first thing that they finished off! I made two small chocolate cakes from a simple boxed mix and layered them with a chocolate filling to create an easy Mario cake. I colored some store bought frosting blue and covered the entire cake with it. I piped on some white clouds and a cloud like band around the bottom of the cake to blend with the white plate I served it on. I placed a small plastic Mario toy on one of the clouds in the center of the cake. 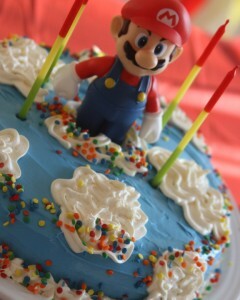 The toy made the cake super exciting for my son, especially because he got to keep the Mario toy afterwards. 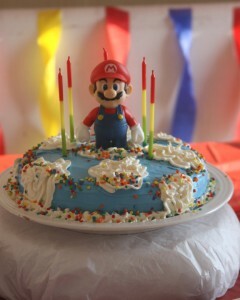 I added some primary colored sprinkles around the bottom, and top of the cake as well as around Mario. I found some great candles at Target that fit perfectly with the theme of the cake. I used a chip serving tray flipped upside down and covered in tissue paper to look like a cloud underneath the cake. It was a solid sturdy place to set the cake and gave it a little extra height. With 4 and 5 year old boys in the house, I had to have something for them to do that would keep them busy and interested. There was an endless amount of energy in the house, so having activities was important. I came up with a couple of games that could get everyone involved, and not have them sitting in one spot too long. All the boys had fun playing Pin the mustache on Mario! I made a board using a piece of foam poster board from the dollar store. I covered it with a piece of blue plastic tablecloth that I had gotten for the party. Next I printed a few graphics off from the computer on to card stock paper and taped them to the board. My son had fun making the clouds to add to the board. We also used the term 5UP throughout the party decor because my son was turning 5. I found a Mario shirt in the woman’s section at Walmart on clearance for $2.00 that I used to make a blindfold for the game. I just cut straight across the top and the bottom of the graphic on the t-shirt and then one cut in the back, and I had the perfect Mario themed blindfold. All of the boys were thrilled to wear the blindfold and get there turn at the mustache game! I printed off mustaches using my home computer and put one piece of thick double sided tape onto the back of each one. I left the backing on the sticky side that wasn’t attached to the paper until each child’s turn, then I removed the backing. Each mustache had a child’s name on it so I could keep track of who was the closest at getting the mustache where it belonged. I had a small plastic Mario cube filled with candy as the prize for the winner of the game. Of all the boys there, my almost three year old daughter won the prize for pin the Mustache on Mario game! Luckily the cube had enough candies in it for each guest to get one – so everyone was happy after the game was over! 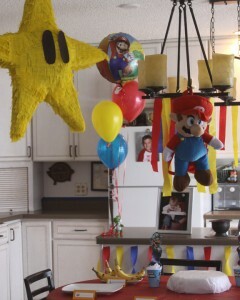 My kids and I made a Mario star shaped pinata filled with all sorts of goodies for the part goers to enjoy. We had a great time putting together the pinata, and my son was so thrilled with it when it was all done. It became not only a great activity, and decoration for the party, but it was a fun project for us to do together in preparation for the big day. 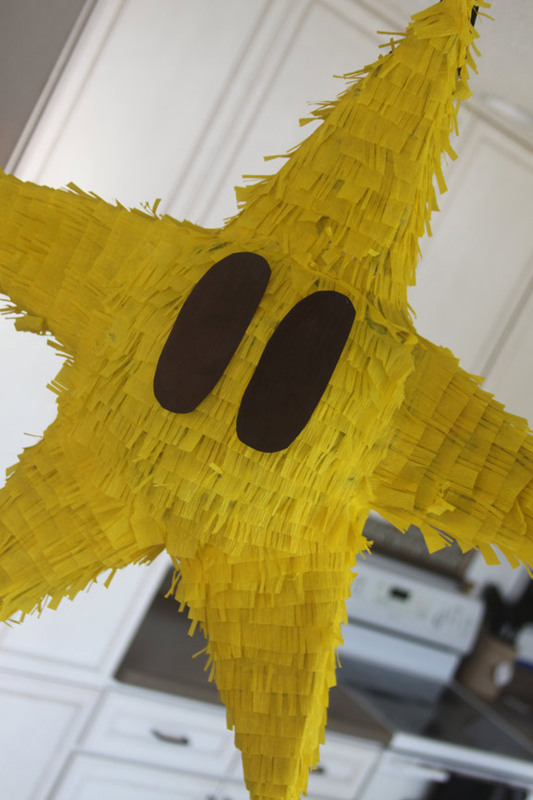 I will do a pinata making tutorial soon so you can see how this all came together in case you want to give it a try for yourself. The pinata was made with cereal boxes, a balloon, flour, newspaper, tissue paper, and glue. All stuff that we have around the house! Making your own pinata is a great way to save money on parties and still have a great activity for the guests. 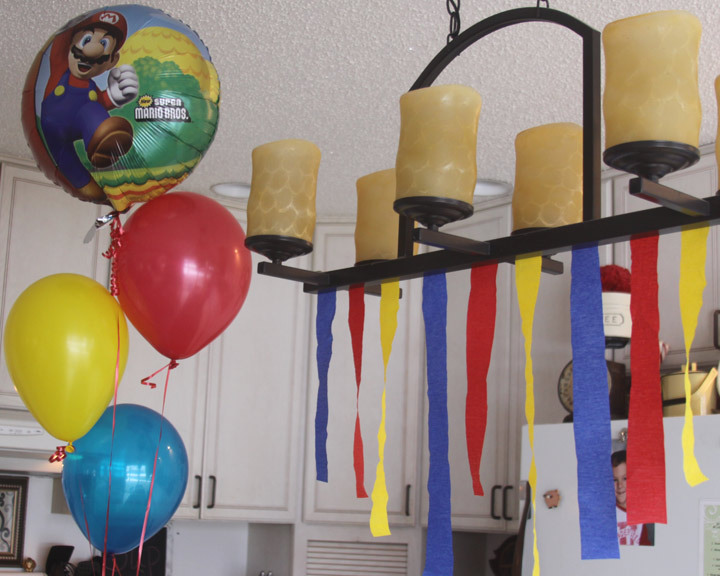 The Decorations for the party where a mixture of things we already had, a few Mario themed and colored balloons and some coordinating streamers. I hung streamers from our light fixtures at altering lengths above the table and our kitchen island. 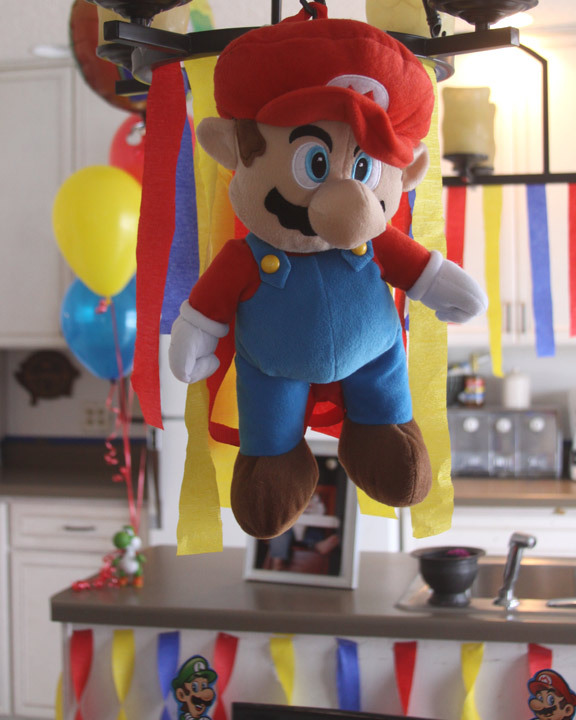 My son got a plush Mario backpack for Christmas that I used to hang over the dining room table. The combination of the simple streamers, balloons, and pinata made the party bright and cheerful. By the time I finished the games and pinata I didn’t need to do a lot of decoration to make the room look really festive. My son was overjoyed when he got home from school and saw everything hanging in the dinning room. 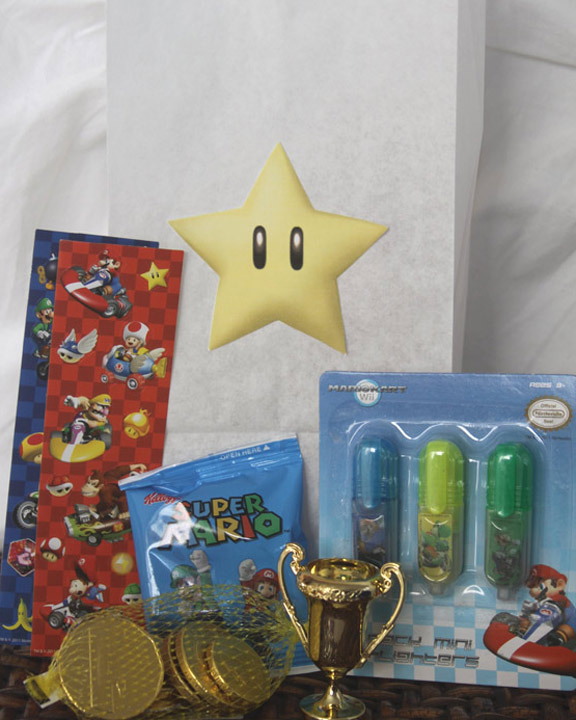 I ordered one Mario Mylar balloon from Birthday Express as well as some plates to serve food on and cups to use as decoration. I was unable to find any Mari themed party plates and balloons at any of our local party stores, so I ordered just a few things online. I can always find coupon codes online before I order to save a little money. Because we were serving barrel juices we didn’t need the cups to drink out of, so I incorporated them into the decor of the party. I cut some Mario and Luigi graphics out from a box that my son got containing a Mario blanket. They were the perfect table decorations, and didn’t cost me a cent. I glued large Popsicle sticks to the back of them and stuck them into the Mario cups that were stuffed with white tissue paper. 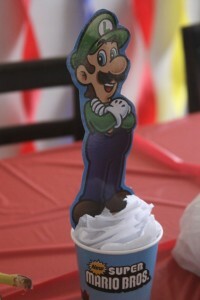 These were a great little decoration and my son is still playing with the cutouts of Mario and Luigi attached to Popsicle sticks. I used the remaining part of the blue plastic table cloth to make a backdrop for the favor table. I printed Mario cloud with eyes and cut them out and taped them onto the blue sky. I made 5 of them and added a number to each one for each year of my son’s life. 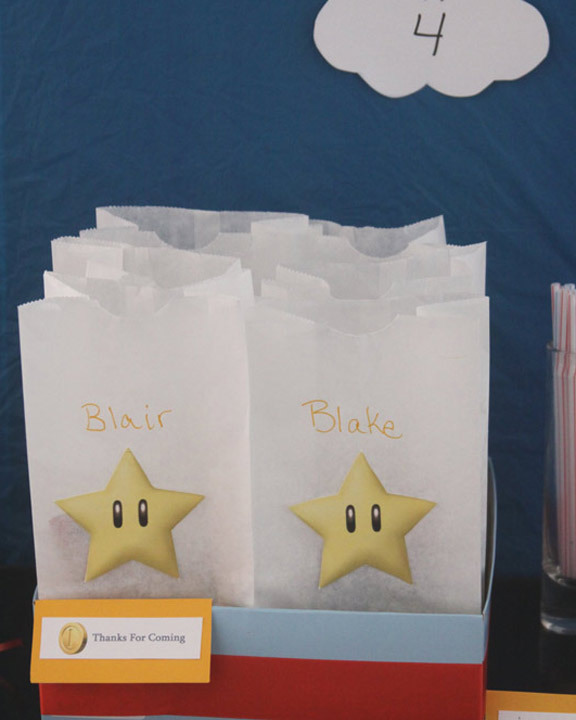 Each party guest left with a white favor bag adorned with a Mario star and their name. I also handed these bags to the kids after they broke the pinata so they had a place to put all of their goodies. The goody bags included Mario sticker sheets and Mario highlighters that I found at Target’s dollar section. It also contained a bag of chocolate gold coins and a little trophy (6 for $1) from the dollar store and Mario fruit snacks that I found at the grocery store. I sure hope that each and every one of the boys that came had a blast! I’m pretty sure the noise level in our house has never been as high as it was the night of the Mario Party. I hope my little guy had a special night with his friends and that he will have fond childhood memories of a special party for his 5th birthday! I really love this! 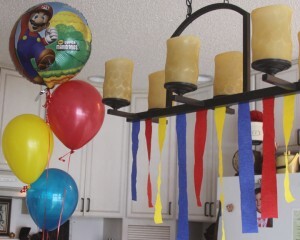 My son is obsessed with anything “Mario” and I am going to make his birthday party of Mario. Thanks for the awesome ideas!! I am planning a Mario themed party now and will definitely be using some of these! One thing I’m doing is making chocolate mustache lollipops!! Awesome! 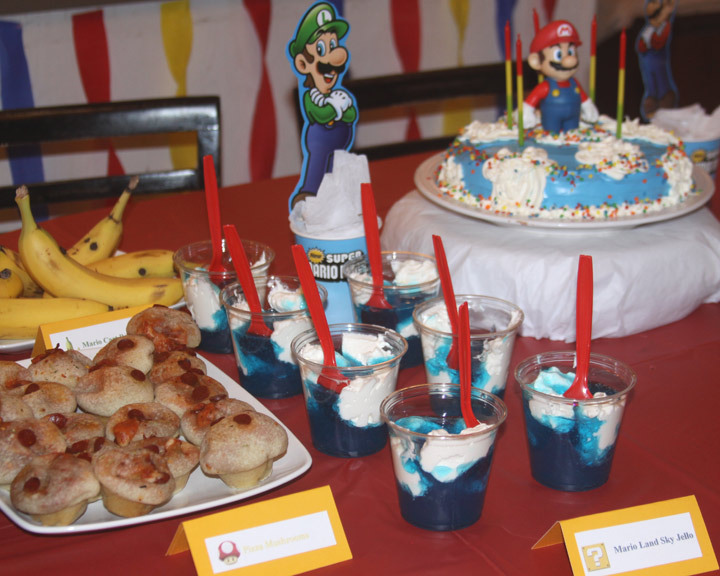 My son and his friends got a kick out of all the mario foods – I wish I had thought about the mustaches – that will make the perfect mario treat!! HAVE FUN! I love your ideas! 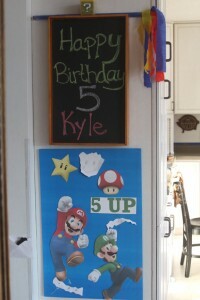 My almost 4 year old loves Mario and has asked for a Mario themed birthday in June. Thanks for the ideas and tips! I have just looked at a gazillion web pages looking for Mario Party ideas for my boys’ birthdays this year, and yours is by far my favorite. Thank you for sharing your ideas! Did you follow a recipe for your pizza “mushroom” muffins? What did you do to make them look like mushrooms? I’ve been searching all over Pinterest for Mario ideas, and yours are definitely my favorite! !